DUBLIN 2, Ireland, 11-Oct-2018 — /EPR FOOD & BEVERAGE NEWS/ — The unwavering consumer focus on personal variables such as effects of aging, being conscious about self-image and physical attractiveness has been capitalized by personal care product manufacturers, and as an outcome, new personal care and cosmetic products are introduced to the market on every day basis. Furthermore, personal care and cosmetic product manufacturers have also shifted towards ingredients that impart multi-functional properties to products. Among various types of such ingredients, including but not limited to, modifiers, emollients, and stabilizers, emulsifiers and co-emulsifiers are witnessing a surge in demand, especially from the cosmetics and personal care in Europe. According to a Fact.MR study, Europe accounts for nearly 40% revenue share of the global emulsifier and co-emulsifier market. Food emulsifiers and co-emulsifiers are classified into broader categories i.e. synthetic and natural emulsifiers or bio-based emulsifiers. 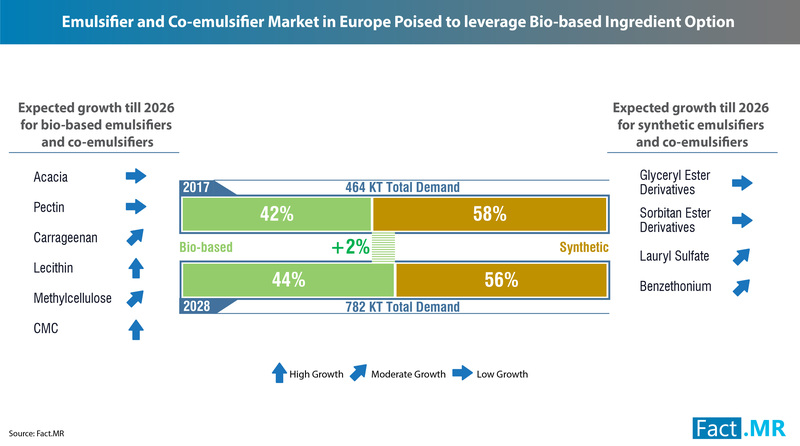 According to the Fact.MR study, of the total 464 KT demand for emulsifier and co-emulsifier in Europe in 2017, the difference between bio-based emulsifier and synthetic emulsifier was insignificant. Synthetic emulsifiers and co-emulsifiers lead the pack currently, however, demand for bio-based variants is encouraging, signifying shifting consumer preferences. Bio-based emulsifiers have the advantages of being economic to the scale of production, are non-toxic, and easy to handle. According to Fact.MR’s study, demand for bio-based emulsifiers is likely to witness a surge on account of these attributes. However, the study opines that challenges, especially large volume needed to be effective as emulsifier, along with the need for preservative while using these natural emulsifiers can stymie uptake. Although the Fact.MR study remains bullish on the long-term prospects of emulsifier and co-emulsifier market, adoption of feasible alternatives by the food processing and personal care industry can impede growth. The effectiveness of new baking enzymes, such as lipases & transglutaminase, can offset the demand for emulsifiers and co-emulsifiers. This enzyme helps in cross-linking the gluten proteins as well as improves the stability and consistency of the dough. Enzymes are proving to be a better alternative to emulsifiers owing to their cost-effectiveness. These enzymes are of utmost importance with regards to mixing, handling and fermentation stages of dough. The myriad properties of emulsifiers — stabilized emulsions, homogeneity in creams and solutions, and stabilization in the anti-aging as well as hydrating creams — make these a perfect fit as an ingredient. Additionally, the market actors at different nodes in the value chain understand the relevance of keeping product development in sync with the end user demand, be it the base ingredient or additives for formulation. For instance, as skin care formulations are becoming stronger, formulators are focusing on manufacturing multi-functional and effective emulsifiers that enable development of sophisticated personal care products. Emulsifiers also find application as a food additive, wherein these are used for maintaining product quality by retaining the fat content. Increasing incidences of food borne diseases has pushed food processors to use emulsifiers and co-emulsifiers of different source, grade, and quality. Increasing preference for convenience and premium food products among European consumers is resulting in the increasing use of emulsifiers. Demand for emulsifiers has also received a fillip on account of the broader health and wellness trend, as emulsifier use can help manufacturers reduce fat content while improving texture and taste. Along with fat retention, emulsifiers also help maintain overall quality of the food, which has boosted their uptake in the food processing industry. Food brands across Europe are increasing the use of emulsifiers and co-emulsifiers in their products, to prolong shelf life, reducing enzyme attack kinetics as well as prevent food decomposition. FDA and several other organizations have enacted a set of safety norms in order to regulate the use of food preservatives. Industry leaders in food processing and ingredient supply are investing in research and development for formulations that are healthy, and do not carry risk of side-effects – Cargill’s new innovation of de-oiled canola lecithin in its product range of emulsifiers stands as an apt example.